Afterimage, recently released on Driff Records, was recorded live at Constellation in Chicago and follows in the footsteps of last year's studio recording Circuitous. 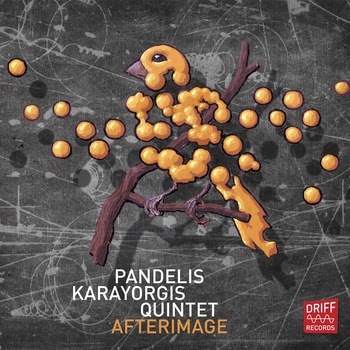 As you may already know, besides the Boston based group leader pianist Pandelis Karayorgis, the group is comprised mainly of Chicago based players* – and benefits wonderfully from this East meets Mid-West dynamic. Featuring all new compositions, like the previous recording, the songs still draw some influence from the compositions of Thelonious Monk and Steve Lacy, but this recording finds the group playing a bit farther out. The high energy 'The Ledger' kicks things off in a melodically rich manner. A splash of piano and a syncopated horn riff and then off into a cooly abstract sax solo. 'Haunt' kicks off with an extended solo from bassist Nate McBride and builds into a group crescendo that ends abruptly as the song fragments. The spirit continues on 'The Nest', which features a two chord ostinato on the piano reminiscent of Filles de Kilimanjaro-era Miles Davis over which the horns go at it. We're back on solid ground with 'Velocipede' - the saxes are wailing, the pulse is strong, the bass is walking and the drums are swinging. Karayorgis plays a hell of a solo - unexpected chords and dissonant double stops fly by, economical and precise, unresolved, yet utterly fulfilling. The title track is a treat as well, from a few moments after the open ended intro and a great bass clarinet passage, the track evolves into a multifaceted conversation and the free interchange is just perfect. Afterimage, captured live, but sounding studio sharp, is an excellent album whose tracks expertly strike a balance between free and composed. It seems that the group, by pushing out a bit further out into the free playing, deliver yet another top notch recording. *The group: Pandelis Karayorgis: piano; Keefe Jackson: tenor saxophone, bass clarinet; Nate McBride: bass; Dave Rempis: tenor saxophone, alto saxophone and baritone saxophone ; Frank Rosaly: drums. I found this album quite engaging. I gave it multiple listens and it built interest and pleasure. Glad to see it positively reviewed. Great record. Aware of the tradition-and modern.